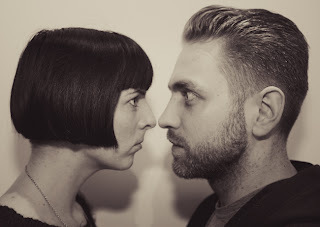 One of my favorite personal blogs is the überlin blog by Berlin Brits James and Zoë who moved to Berlin a year ago and with whom I've connected via Twitter when I was still there. I can't quite remember how we initially "met" online - but I do remember that several times by pure chance we posted about the same things, e.g. the Computerspiele Museum . While I made my one-minute videos, they would display beautiful shallow depth-of-field and macro photographs with short write-ups. Zoë and James have learned the "German stare"
We eventually met in person and it was amazing to see them in 3D and hear that they had British accents. But that's besides the point. Their simple and stylish blog is about living the expat life and their passions. James is into electronic music, Zoë is into fashion and photography - both are into design, Berlin and food. They have a wonderful sense of humor and two beautiful cats: Iggy and Otis. Their posts are short and to the point, often humorous and with lots of excellent photos. Instead of sharing my favorite posts, I recommend for you to just go exploring their sites.